Burning sage has hit the mainstream, but should you buy it in stores? The practice of smudging has been used by First Nations people for a long time. It has become more mainstream in recent years with kits being sold online. But should you buy them? Smudging appears to have officially hit the mainstream with online and retail stores selling kits that include how-to books, smudging bowls and even feathers. But why do people burn sage? And should you purchase these medicines online or in stores? Teachings and customs vary from elder to elder, community to community, and nation to nation. CBC sat down with Anishinaabe knowledge keeper Debra Courchene to ask about her practice of smudging. Courchene is from Sagkeeng First Nation. Every day in the morning, she rolls sage into a ball, places it into a small cast iron pan, strikes a match and begins her daily routine by smudging and giving thanks for the day. "If I'm having any kind of issues happening and difficulties, or I'm not feeling quite centred, I'll take the time to smudge myself," said Courchene. Courchene said she uses it to help her pray for her family and she considers it a medicine. "My understanding is that we have been given, as Indigenous First Nations people, medicines to be able to carry us. The four main medicines are sage, sweetgrass, cedar and of course the first medicine, which is tobacco. And we use that tobacco to be able to make our offerings to talk to our Creator," said Courchene. She said burning sage and other medicines like sweetgrass are a chance to purify the air. "It allows for me to be able to get rid of anything negative that I may have picked up and then it replaces that with positive energy," said Courchene. Molly Menow is the manager of Teecka's Aboriginal Boutique, a First Nations-owned store at The Forks in Winnipeg. "As far as I know, we've been selling [medicines] since I first started here. 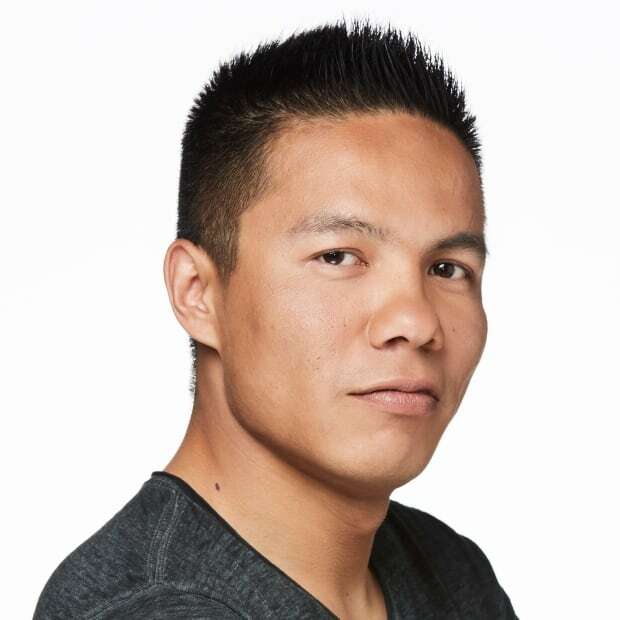 That was seven years ago," said Menow, who is from Norway House First Nation. "It makes things easier for others to get it, that don't know how to get it, or don't know where to go." She said she gets about three complaints a week from people who think the store shouldn't be selling sage or sweetgrass. "Medicines were for trading. You trade for goods, you trade for meats, you trade for services. Unfortunately, in modern days, you trade it for value. You need to live," she said. 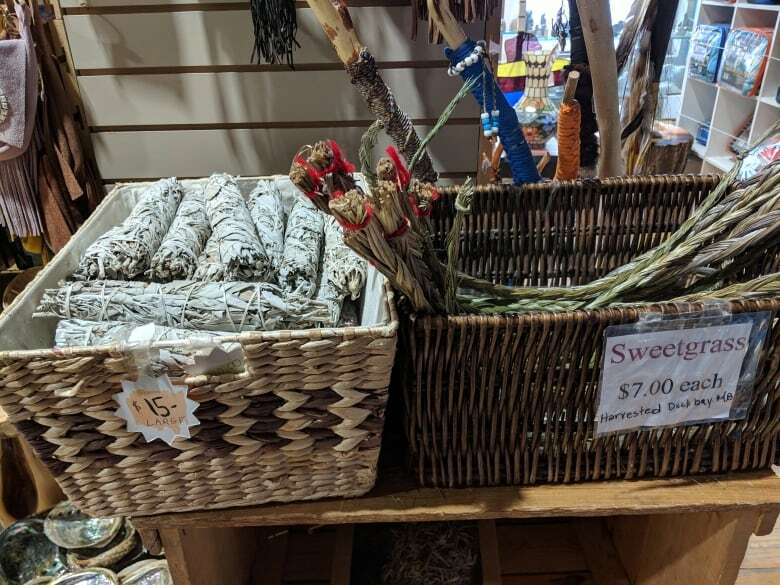 The store sells sweetgrass and two types of sage, buying the medicines from First Nations and Mé​tis harvesters in Manitoba. 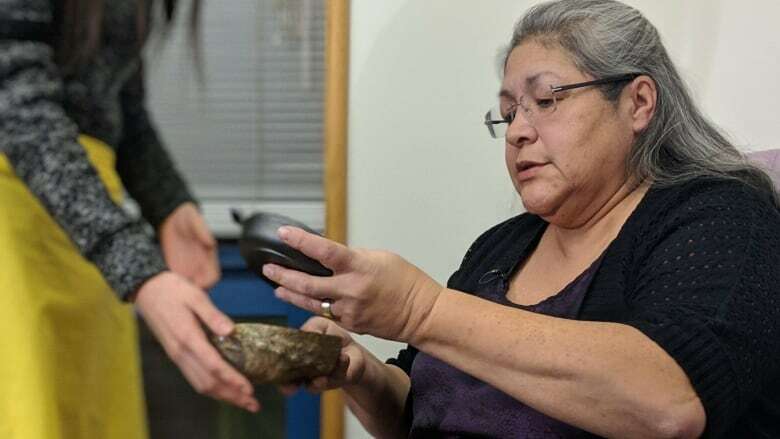 Menow said the primary customers are non-Indigenous people and organizations who buy the smudging kits, which feature abalone shells, sage and a small brochure on the basics of smudging, as gifts. "It's a lot of non-Indigenous people who do buy them because they don't know where or how to [get them]," said Menow. "At least when they come here, they have some information on different medicines and what their purposes are." Although it has become more popular in mainstream society, Courchene said she wouldn't purchase sage or other traditional medicines like cedar or sweetgrass in store or online. "I myself will pick my own medicine and or with somebody that I trust," said Courchene. "When you take the time to go [picking], there's a preparation that happens with these medicines. You don't just go and pick without giving something back." Courchene said prior to medicine picking, she will offer tobacco to the land to give thanks for what is about to be taken. "We're very careful about how we pick [medicines]. We never over pick. And the thing about picking medicine as well, you have to be in a good place [mentally] to be able to do that. "You have to you have to be in prayer. You have to talk to that medicine because it's giving up its life, while you're explaining what it is that you need it for." Courchene said she does not feel it is up to her to judge who uses and doesn't use medicines like sage, as long as they are not abusing the medicine.